RChrono is a chronometer watchapp for the PEBBLE watch. Originally I created RChrono for my TIMEX Datalink USB watch (10 years ago). Running GPS were not common, so I developed a chronometer that gave me an estimation of my final time in a marathon. I used it in some marathons before I bought a running GPS. Now I have a PEBBLE and for some training I want to use it. While I’m training I don’t wear my phone so that’s why I decide to adapt my old program to the PEBBLE. First, RChrono is a standard chronometer with 30 lap’s capacity. The interesting feature is the final time calculation. An example of use is better than a long description. You want to run a marathon. In the setting menu, you set 42.2 for the final distance. At the beginning of the race you start the chronometer. Commonly on a marathon you have label each 5km (sometime each kilometers). At each label, you press the lap button, you enter the distance and the watch will estimate the final time. It will be updated each you time you enter a new distance. The Auto-distance feature allows the program to automatically add an amount of distance at each lap. For example, if you set 5 the program will add 5 to the distance each time you press the lap button. You will have just to validate the distance (or you can modify the distance). When you start the application, the “Chronometer page” is automatically displayed. After you have the following navigation thru the pages. On the main menu, select RChrono to execute the application.RChrono is a watchapp and not a watchface. All the application data (Chronometer time, laps and options) are saved if you quit the application. If you download a new application from the phone, the application data will be canceled. Short press: Turn on the light for a few second. Long press: Reset the chronometer, the laps and distance. SELECT button: Short press: Run or stop the chronometer. DOWN button: Memorize the current chronometer time and display the LAP page. This window displayed the current lap number and the lap time.On the bottom of the screen the distance is displayed. If the AUTO-DISTANCE option is selected the distance is automatically increased. UP button: Increase the distance. SELECT button: Validate the distance, calculate the final time, memorize the lap time and return to the main window. DOWN button: Decrease the distance. BACK button: Cancel the input and return to the main window. In this example the first kilometer was ran in 4min31. If you continue to run at the same speed the final time will be 41 minutes 40 secondes. This is the main menu of the application. UP button: Select the previous menu item. SELECT button: Display the selected page. DOWN button: Select the next menu item. BACK button: Exit the application and return to the main watch menu. On this page you have the list of all the laps. UP button: Scroll the display up. DOWN button: Scroll the display down. BACK button: Return to the application menu. On this page you can measure your heart rate. Search your pulse with your left hand (on the neck it’s the easier). Put your right thumb on the UP button. At 10th pulse, press UP. The heart rate is calculated and displayed. The heart rate is in BPM (Beat Per Minute). 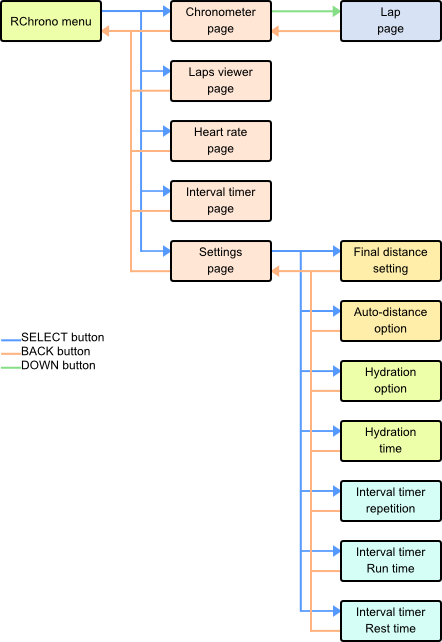 UP button: Start and stop the procedure to measure the heart rate. Once the heart rate is displayed, another press restart the procedure and display “Search pulse”. This page allows setting the options of the application. Allow to enter the final distance. Allow to turn on/off the automatic distance feature. Allow to set the distance added at each lap (if the auto-distance feature is on). Allow to turn on/off the hydration alarm feature. Allow to set the hydration timer. A first page allow to set the minute of the timer. A second page allow to set the second of the timer. “Final distance”: Display the input page. “Auto distance”: Toggle the option (On/Off). “Auto dist. Value”: Display the input page. If you select «Final distance» you’ll have a first screen that allows entering the integer part of the distance. Once you press “Select” you will have a second screen that allows entering the fractional part of the distance.If you want to abort the input press the BACK button. A comment, a request or an issue? Go to the forum.